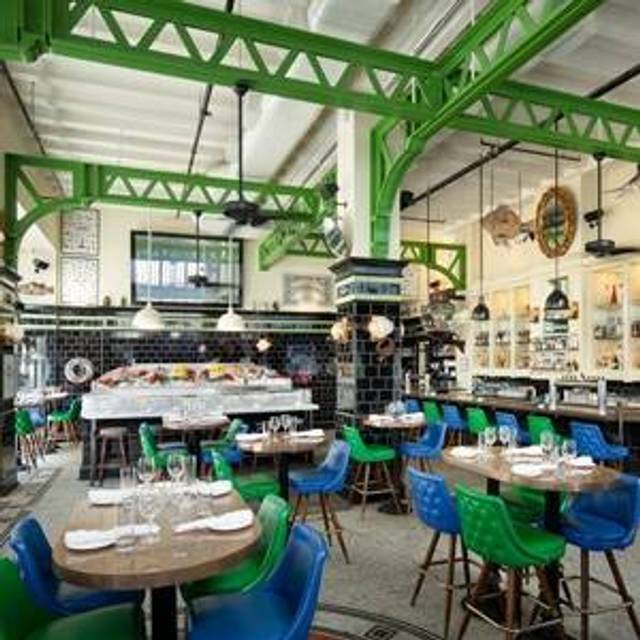 The John Dory Oyster Bar, a casual, seafood-focused restaurant by chef April Bloomfield at Ace Hotel New York. With its floor to ceiling windows, copper high top tables & counter seating, outdoor patio, great music and upbeat staff, The John Dory is a popular place for after-work happy hour, brunch & romantic dinners. Whether celebrating a special occasion with family and friends or hosting a corporate event, John Dory Oyster Bar can accommodate all of your special event needs. The John Dory Oyster Bar is a solid NoMad hang for beers and bivalves. We arrived at the restaurant for our table of six reservation and the hostess was not expecting us. They seated us at a four top with two added barstools on the ends of the table. Then, they set the table and handed us menus. ALL of the oyster selections were sold out - marked with a red "sold out" stamp. We asked what was going on and were told that the restaurant was closing its doors the following day - for good. Question: shouldn't someone have informed us ahead of time about this? Yes. In my opinion, we should have definitely been notified. It was a Friday night in NYC and we were a party of six. Our options for another restaurant were extremely limited (to places that not many want to spend their Friday nights). So, we had a very disappointing meal at a restaurant that could seat us. The music at John Dory was unbelievably loud, as well. I feel that John Dory and OpenTable should be responsible to let patrons know that the restaurant they pick will be closing the following day. There is absolutely no way we would have gone there had we known that. Terrible. Too dark. Too loud. Too limited of a menu. Never had a less than perfect oyster. So sad that JD is closing. LOVE THIS PLACE!!!! ONE OF MY FAVORITE SPOTS IN NYC! Good food but portion sizes were very small for the money and the value was not there. Service was good and the atmosphere was nice but I left hungry after spending $120 on dinner for 2 and a couple beers. Raw oyster is very fresh, it tastes good! The lobster roll is soooo good! Lobster is so fresh and delicious, bread smells so good. But the service is so-so. Maybe because there are too many people. We waited for a little long time to be served. It's noisy there. Disappointing experience as the wait staff seemed uninterested in helping us. They looked understaffed but there was no apology for inattentiveness. And the food was so-so at high prices. Third time dining her and the service is simply atrocious. Even told the manager last time and he noted, "Well. That is your opinion." It could be so wonderful if they simply had staff that checked in on you at some point during the meal, greeted you any time before 10 minutes after you're seated or that you didn't have to trip just to get their attention. Made a reservation for 2 - was seated at a community table and then asked if we could move to accommodate a larger party. Would have preferred to have had a 2 top as originally requested. Food was nice, just wish the service was more organized. Hostess was great and accommodating. Servers were terrible. Had to call them over to take my order and I was sitting right next to their register! They seemed impatient to explain the oysters and point out which were which when they arrived so I’m not even sure what I was eating. This is supposed to be an oyster bar. Otherwise the place is ok. Not worth waiting in a line but fine for a quick drink and some oysters. We had been here several times before, and loved it. This time was no exception, except that, when we called ahead to say we were running a bit late, they didn't have a record of our reservation, despite our having confirmed it more than once (including through Open Table). So this is my fav restaurant in NYC. I brought my mother- who was visiting- for dinner and it was kinda loud for her and she didn't like the table we were sat at and blah blah blah. And the amazing staff went above and beyond to take care of us and made the night fantastic. Mama was happy and smiling and saying how great the food was (which is was) by the time we left. 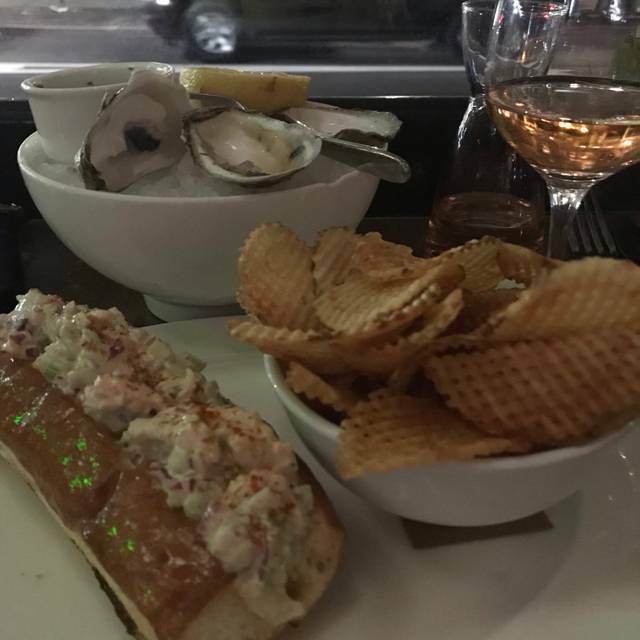 They are a little pricy and the food is so good and the place is so trendy that I didn't expect it to also have the kindest staff and best hospitality I've seen in all of the city. Thank you!! The clam chowder was one of the best meals I’ve had in my life. Crispy buttered toast to dip. Yum yum yum. Very loud- there are no sound absorbing surfaces which makes it very noisy where a large table can not talk to itself. Great raw bar, portions small, cocktails good. Service was terrible and food was undercooked. This place is way better suited for drinks and oysters, not a meal. Awesome clam (in the shell) soup. 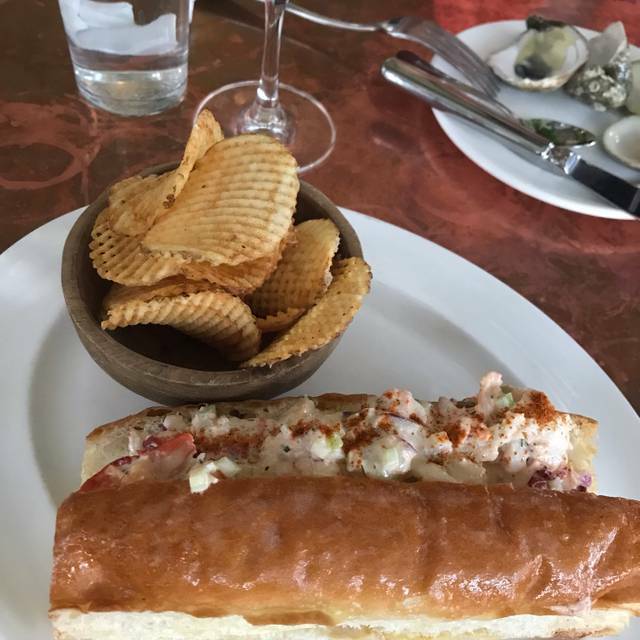 Much better than average lobster roll. The music was so loud that you could not hear the people from the table. Not enough space between the table ended up waiters dropping drinks on clients. 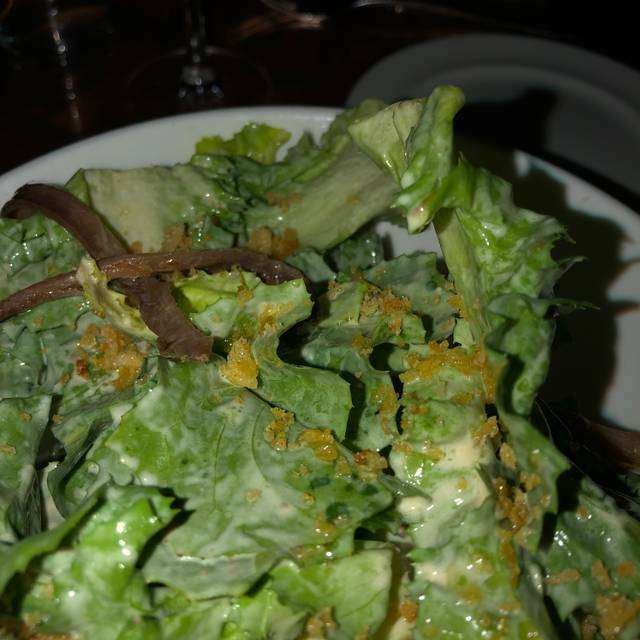 The food is extremely expensive for the quality. It was totally empty. For a 2pm on a weekday it felt weird. Top lobster rol and very good oysters! Nice people, a sparkling fresh glass of rosé... what do you need more! Last time I ate here it was sensational. This time I took friends, the menu was very short, poor selection of fish. Staff were friendly and after our main course was cleared away we were told the chef had a whole branzino that we could have had! I love John Dory! The food is fantastic and its a welcoming place where you can go by yourself and sit at the window or with a group. I was excited to try April Bloomfield’s restaurant but was underwhelmed. Overall just an OK experience. Food was very good, but service was inattentive and it was too loud to carry on a conversation. Check it off the list, but probably won’t be back. Food was fine, ambiance as well but the service was sub par. We were treated well at first then the original waitress disappeared and all went downhill from there. Management invisible. Yum yum soo good. We were there on a Friday night and it was very busy so service was only ok but everything we ate was excellent! Yellow Fin was astounding. Happy hour oysters for $2 each, lobster and burrata, baked clams. Very very very very pricey but so good. Recommend for a snack and drink. The plateau of shellfish and amazing oysters. FRESH SEAFOOD, SERVED TRADITIONALLY OR EXPERIMENTALLY WITH ATTENTIVE, FRIENDLY SERVICE. GREAT DECOR. Came on thanksgiving at 6pm thought they would have happy hour which they didn't. Very limited menu. Oysters were good but very expensive at 4$ a piece. Overall a bit disappointing. Fabulous. Oysters were the best I've had. Our evening was not the best because of our waitress. While trying to be helpful, she was difficult to understand. Brought the wrong food for one of my guests and forgot my wine order. Delicious seafood, great kedgeree and haddock fritters. Service very good. Went for brunch. The seafood is simply the best. The oysters and the lobster were fresh, tasteful and perfect. Great food. Great clam chowder. Thinner broth than usual but perfect. Big hunks of clam and bacon. Great lobster roll and great service. the bill came. We were there during Happy Hour when the Prosecco was listed at $6 a glass. We were charged the regular price of $13 a glass. A difference of $28 on our bill!